The mysterious Zuma payload sits atop a SpaceX Falcon 9 rocket at Space Launch Complex 40 at Cape Canaveral Air Force Station in Florida. Liftoff is currently scheduled for Nov. 17, 2017. We're going to have to wait at least another day to see the top-secret Zuma payload take flight. The launch of Zuma atop a SpaceX Falcon 9 rocket has been pushed to Friday (Nov. 17) at the earliest, SpaceX representatives said Thursday (Nov. 16). "We have decided to stand down and take a closer look at data from recent fairing testing for another customer," SpaceX communications director John Taylor said in a statement Thursday afternoon, referring to the nose cone that protects a spacecraft during launch. "Though we have preserved the range opportunity for tomorrow, we will take the time we need to complete the data review and will then confirm a new launch date." The soonest Zuma can now lift off from Launch Pad 39A at NASA's Kennedy Space Center (KSC) in Florida is Friday, during a window that opens at 8 p.m. EST (0100 GMT on Nov. 18). 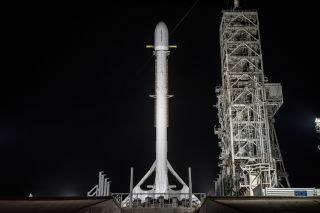 If the launch happens Friday, you can watch the Zuma launch live at Space.com, courtesy of SpaceX, beginning at about 7:45 p.m. EST (0045 GMT). You can also watch it directly via SpaceX's live webcast page here. This is the second delay for Zuma; the mission was originally scheduled to lift off Wednesday evening. Zuma is a U.S. government payload headed for low-Earth orbit, but that's pretty much all we know about the craft. It's unclear what the satellite will do once it's aloft, or which government agency will operate it. The Zuma launch will also feature a landing attempt by the two-stage Falcon 9's first stage. To date, SpaceX has pulled off 19 of these rocket touchdowns, and it has reflown landed boosters on three separate occasions. This story was updated at 6:30 p.m. EST to include the statement from John Taylor.